Fill your jobs faster and increase your placements by saving time on processing profiles, sourcing the best candidates and discovering new leads. Textkernel’s multilingual CV parsing software and its semantic search, sourcing, matching and lead generation tools will transform the way you’re doing business and help grow your business exponentially. Every CV you receive is automatically converted into a complete and searchable candidate profile in your ATS or recruitment system. In addition to saving time on manual data entry, you will also increase your conversion rate by providing candidates with a fast, easy and mobile-friendly application process. Find better candidates faster with Textkernel’s semantic and user-friendly search software. Easily discover interesting talent in your own database while simultaneously sourcing across multiple CV databases and professional networking sites. Quickly place your candidates with Textkernel’s semantic matching technology. Match! automatically creates a search query from a job description or a candidate profile and finds the best matches in your internal databases, on the web or in Jobfeed. Discover opportunities and make acquisition more effective. 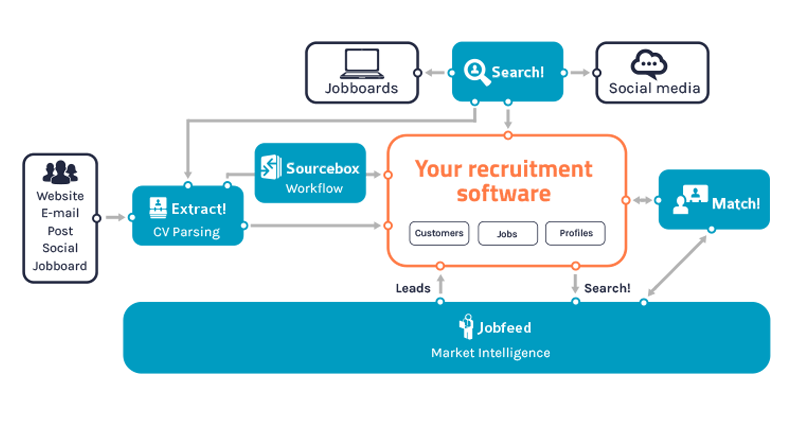 Jobfeed collects, structures and classifies all online jobs and makes them searchable. Generate leads, save time, gain insight into your market and find the companies most likely to do business with you.